Star Wars: The Old Republic is in line to get one of its biggest expansions yet, with the Onslaught expansion being revealed during this year's Star Wars Celebration. Star Wars Celebration has come and gone, with fans getting the best of the franchise from all facets of pop culture. For the gaming community, the weekend belonged to Respawn and the upcoming Star Wars Jedi: Fallen Order. However, that wasn't the only Star Wars game to have a major presence at the convention. 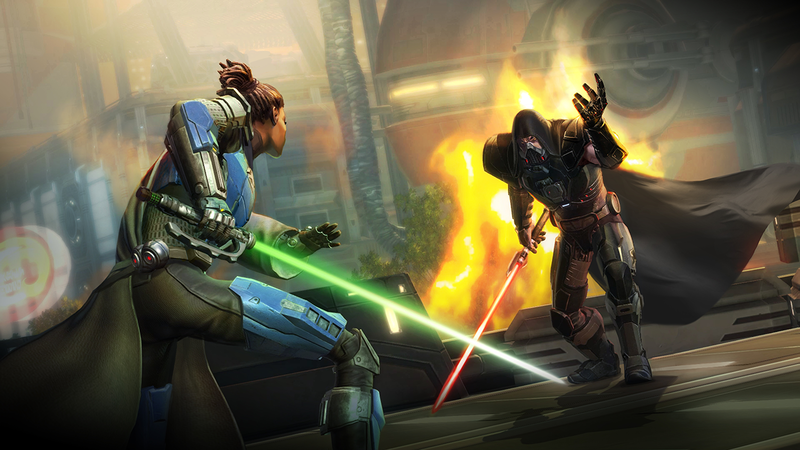 Star Wars: The Old Republic was on-hand, as well, and revealed what's next for the long-running MMORPG. "War between the Galactic Republic and Sith Empire blazes across the galaxy. Crucial resources dwindle as piracy and crime escalate dramatically. Amid this chaos, the Alliance Commander has the chance to tip the scales in favor of either faction, committing their elite forces to decide the fate of the galaxy. Mek-Sha is a brand new hive of scum and villainy. As noted, players will be in search of allies across the galaxy. Their search will take them to Onderon, a planet that will look familiar to viewers of the Star Wars: The Clone Wars and Star Wars: Rebels television series. There, they'll travel to the planet's moon of Dxun and take part in a new Operation, as they ward off unwanted visitors. They'll also find a new Flashpoint mission on Corellia, along with missions on an all-new setting called Mek-Sha, a fueling station filled with smugglers and general no-goodniks. In terms of gameplay, Onslaught will increase the level cap to 75, adding in a new ability for all Advanced Classes. A new playable species is being introduced, as well. They are the Nautolans, who Star Wars fans will recognize as the race of prequel-era Jedi Knight Kit Fisto. The expansion will also introduce an all-new item type called Tactical Items, which are said to alter player abilities and feed into specific playstyles. Tactical Items can be acquired through PvE, PvP, Galactic Command, or Crafting. Look for gear, as a whole, to receive a total overhaul with Onslaught. For those looking for something to help tide them over until Star Wars Jedi: Fallen Order, consider Star Wars: The Old Republic. The Onslaught expansion is set for a September 2019 release window.